There were only ever two pools at The Lagoon. The smaller one was used for small rowing boats and Red Indian style canoes. It had a hut at the southwest corner from where you bought a ticket, for 30 minutes or an hour, I think, although it could have been 15 minutes and 30 minutes. The larger pool was used for small, varnished, clinker built sailing boats and motor boats. 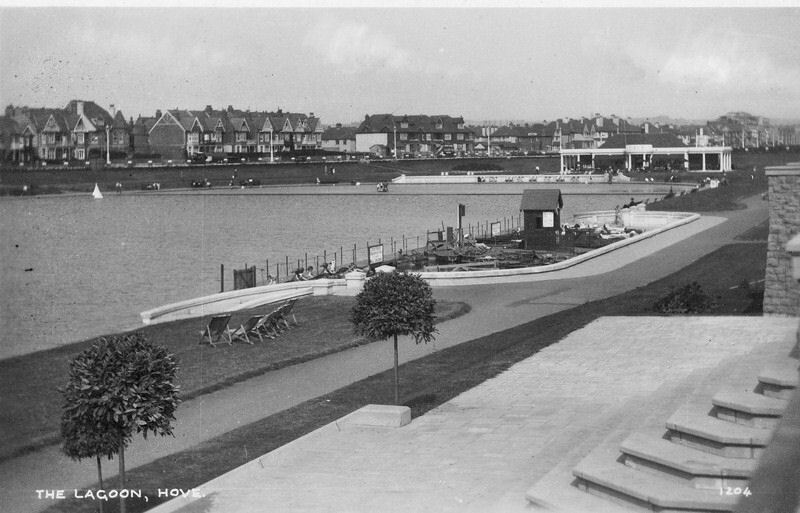 The ‘third pool’ was in fact no more than a recessed area of the main pool that was separated by a wooden walkway with hinged sections to allow the boats to be locked away in there at night. There was also a hut built onto this walkway where you bought tickets for boats on the larger pool. The boathouse for the surfing club is built over this now but the recess was identical to, and directly opposite, the one on the north side of the pool that you can still see today. The trains used to be on the grass just above the northern recess. The larger pool has always been used by enthusiasts for model sailing and power boats. Sunday afternoons at the western end in particular were the most popular day for them but the small pool, too, was used by many boys with plastic hulled yachts. The larger and smaller pools were separated, then as now, by a strip of paved walkway that has a protuberance into the smaller pool about halfway along its length. On this used to sit a large brown marble drinking fountain which was removed sometime in the late 1950s or early 1960s. The paddling pool is quite a recent addition to The Lagoon, I would say within the last 15 or so years. Before that there was a sand pit which often smelt of dogs. The childrens’ swings and roundabouts used to be just to the northwest of the cafe building, and the pools were usually drained once a year or so to clear out the sludge. If I remember correctly, both pools are filled from the harbour by a pipe below ground. As a boy I spent many, many, hours at The Lagoon or just over on either the Hove Deep Sea Anglers beach more commonly called ‘First Beach’. From the age of seven or eight we used to go to the beach all day by ourselves in the summer. Apart from getting home covered in tar (which our Mums would take off with butter), I don’t recall anyone coming to any harm at all. Today, our parents would have been locked up for neglect. I wonder about the date of that photo? It all looks so new and clean it must be soon after it opened, I guess 1930s. I also remember it well as a young lad in the late 50s and early 60s, exactly as Alan describes! I also remember doing rolls around the bars at the small holding pool, getting dizzy and falling in fully clothed. Also crabbing using the bone from the Sunday joint on a length of string, and pulling up crabs! Hi, when I first went to work for Hove Borough Council as a mechanic in 1976 a regular job of the staff of the workshop at Leighton Road depot was to go down to the Lagoon to service/ repair and run a large old four cylinder diesel pump which was housed in one of the arches under the prom towards the western end of the Lagoon. This pump drained/filled the Lagoon from a large pipe that went under the prom and out to the sea near the fishing clubhouse, pump out would be carried out at low tide and pump in at high tide so as to aid the pump and not strain it too much and make the task quicker. The large diesel engine used to be started with a handle which was dangerous, some time during the late 1970s in the early days of the HSE, the engine was removed and taken to the workshop at Leighton Road and converted to electric start. I do not know if this system is still in use. Fish and crabs were drawn into the Lagoon if the filters on the pipe became damaged. What about the big steel hulled model liners that were sometimes anchored in the middle of the large pool? These were on a par with the model steam locomotives that run in Hove Park or Field Place, Worthing. These ships were just beautiful, a real credit to their builders. They must have been about 100:1 scale and I assume radio controlled. The period would have been about 1952 – 58 era. My mum and dad would often take us to the lagoon and we would go in a canoe. Very good memories of the 50s.